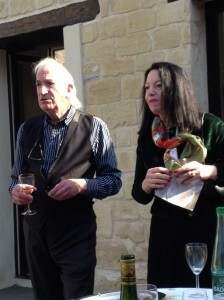 These were our hosts Anthony and Sara Turner (his wife Sara is not in the picture). The woman pictured was our expert at the Louvre. I feel bad that I don’t have her name. After a few hours at the Louvre we took our bus for about our hour to the northeast suburbs of Paris to the home of a renowned expert in the history of scientific instruments and time keeping, Anthony Turner. He also is a book seller and has written some books himself as well the information published about scientific instruments for auction catalogs. 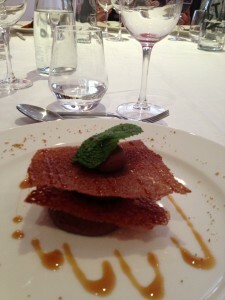 He and his wife Sara put on a rather unexpected wine and hors d’heuvres dinner including dessert. (Sorry Heather, there was too much for me to get down all the details). 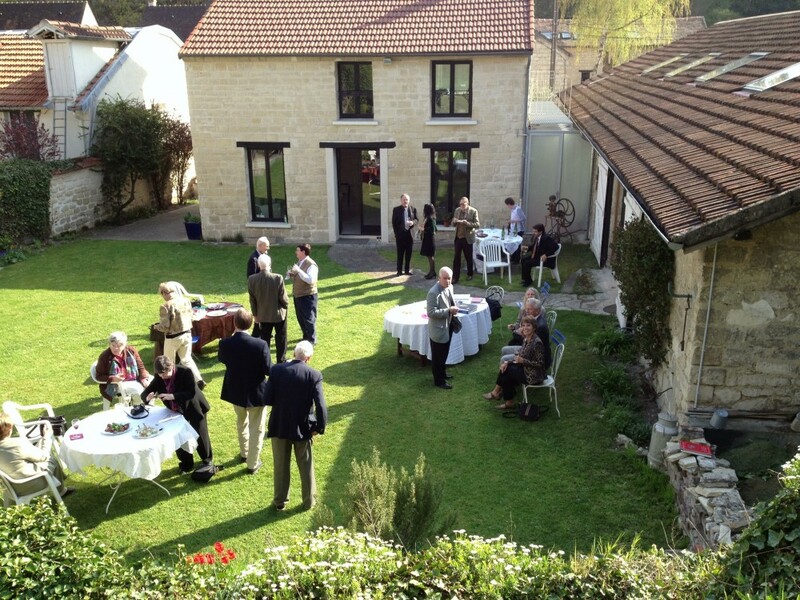 We spent several hours sharing stories, rummaging through Anthony’s books, sipping wine, eating, listening to some fine choral music, and enjoying the late afternoon sun. Couldn’t be better. I did buy three books – couldn’t resist – now I just have to figure out how to get them back on my luggage. The entry of the Louvre is both a nightmare and a awesome. 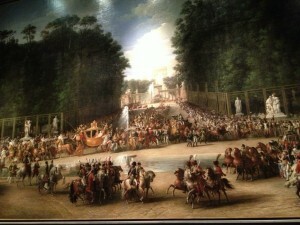 The Louvre is an awesome place! Icon all the others aces that we have been I could be tempted to think I don’t want/need to go to the Louvre. After all it is one of the busiest museums in Paris and who needs all the crowds. By the way, just as an aside, the cost to get into the Louvre is only around $17 – what an amazing bargain. Disneyland is about five times that much and I can’t help but feel I am getting taken. Sorry you Disneyland fans – this is my blog after all – you can write your own. Needless to say, I was glad that we did go to the Louvre – I think you could spend days there easily. I’ll just show you a couple of the clocks because that’s why we went there. 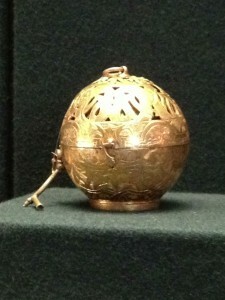 This is a unique ball shaped traveling clock made about 400 years ago. 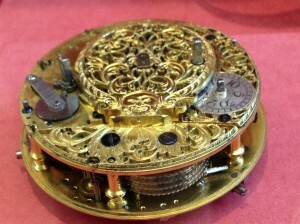 This is another traveling clock about 400 years old. This one is only about 2 in long and has a carved rock crystal cover to see the time through. I have two more posts I wanted to do tonight but it is late and I need my sleep. The pictures take a lot of time to get right. We also went to the Louvre today and to the home of a renowned expert in the history of scientific instruments. It just happens that this guy is one of the speakers at my symposium in Nov, so that was pretty cool. Tomorrow we go to a huge treasure house of scientific instruments that are not on display. And another sales gallery in downtown Paris. 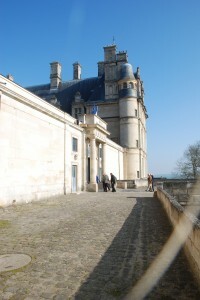 This is the imposing front of the Chateau. Today we went to three separate places, the first was the Musee Nationale de la Renaissance in the Chateau d’Ecouen. It was only about 45 min north of Paris, so, a short ride compared to what we have done the last cole days. This is a typical French chateau that you might see in any French tourist book or if you are watching Le Tour. There is no lake around it but there is a large walled trench that would make a good defense. Of course, no one lives there now but it has some really nice things on display including, need I say, clocks. Here is an engraved block plane. Makes you wonder if they ever used these – I kind of doubt it. 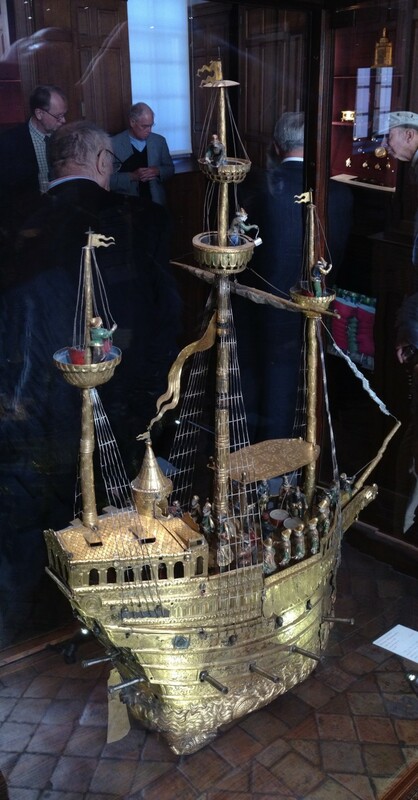 In addition to the clocks and more carriage watches, like we saw yesterday, there was some amazing tapestries, some really neat engraved tools, and a gold ship that had a clock on it but that was a minor part. It was designed to move on hidden wheels and had lots of moving parts. There are no pictures that can adequately represent this ship. It is about three feet tall. It is so big that I had to use the panorama function on the iphone to get it all in. The tapestries were all about the story of David and Bathsheba although I would not have been able to tell had it not been explained. There are 10 tapestries in the set, only five of them filled up this huge hall and they were in absolutely immaculate condition. Sorry this picture is dark. 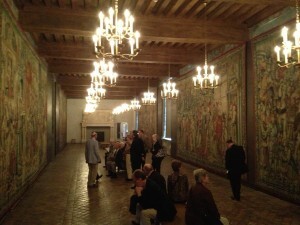 They keep these rooms quite dark to help,preserve the tapestries. The colors are still very good. 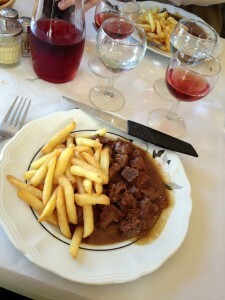 After a couple hours we had a nice prepared lunch in the chateau restaurant. Not quite the same multi-course meal we have been eating for lunch but quite nice. There was a very tasty cuscus along with two kids of cheese, three different types of meat including pastrami and prosciutto. We had a cider champagne and red wine to go with it. 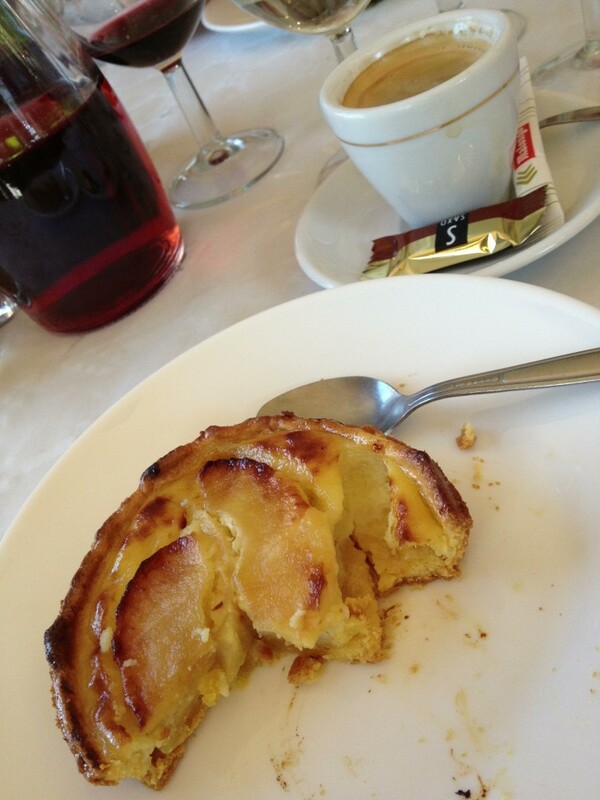 I had a lemon tart/meringue pie for dessert which was to great. 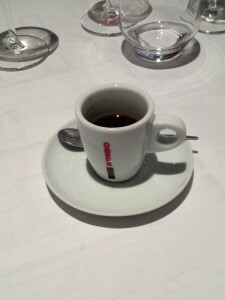 The espresso was good though. Nice lunch. The cuscus was surprisingly tasty. Back on the bus and we were off to the Louvre. 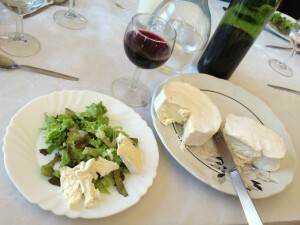 Lunch in Saint Nicholas d’Aliermont was another great French meal with multiple courses. First we had a local cider champagne called kir normande. Then the first course was puff pastry (vol-au-vent?) filled with ham and mushrooms and cream sauce (bechamel). Next course was a beef bourganion with honey clove spicing and pommes frittes (French fries). This had a red wine with it. Then a palate cleansing salad with two kinds of cheese; neuschatelle and normande. And finally an apple tart dessert and espresso. Today we headed for Normandy, a 3 hour bus ride. 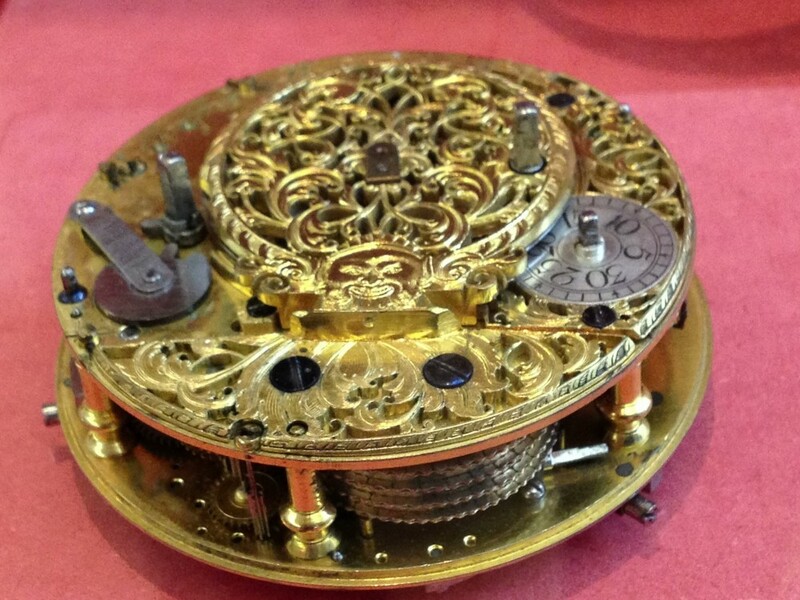 We visited the Musee d’Horlogerie (time keeping museum) in the town of Saint-Nicholas d’Aliermont. The people of this town created a unique type of grandfather clock and later developed the first of its kind factory for the basic movements for many of the French clocks that we have today. 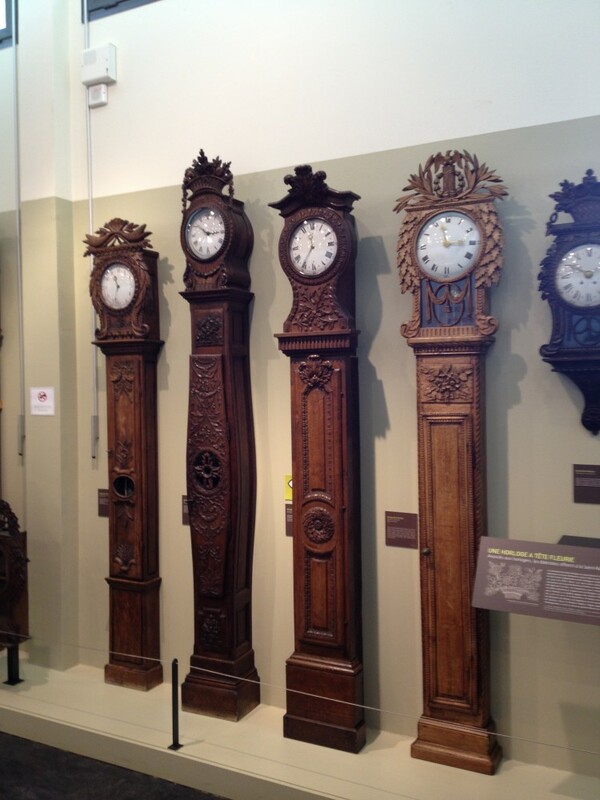 Typical Fench clocks made in Paris but have movements made in Saint Nicholas d’Aliermont. These movements were shipped to Paris to put into most of the expensive artisan style clocks owned by the wealthy of that day. The clockmaking started in the early 1800s and lasted until about the end of the 19th century when business failed due to lack of keeping up with the market trends. For a small town they have an important part in the history of watch and clock making and they have done a nice job of commemorating their history now. 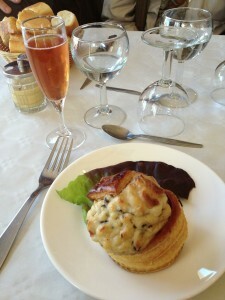 We were welcomed to the town by Mayor Madame Martine and then had lunch in Saint-Nicholas at the Hotel du Commerce. See separate post on that. Then a long trip back to Paris where we saw a gallery of very expensive stuff that all looked like a museum. 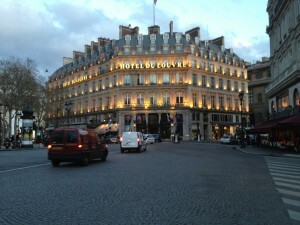 It was downtown Paris just a few doors down from the Musee d’Orsay (the modern art museum). They didn’t let us take any pictures there. I am tired tonite after getting two very early morning starts in a row so I get to sleep in a bit tomorrow. We sat directly across the street from this hotel, on the right hand side in this picture. After getting back from Arras (long bus ride), we were supposed to meet a clock and watch dealer in downtown Paris. Well we did meet him but his shop was so small that it was not really worth trying to file people through. It was about 7:30 already and we had not had dinner, so a few of us decided to find some local eats. 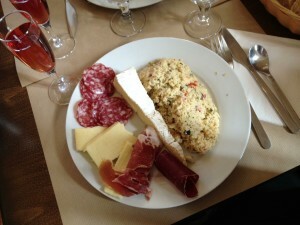 The place we ate is called Cafe Rus and it is about one block away from the Louvre. A couple of us sat outside on the sidewalk and enjoyed the ambience. I hope you can get a feel as well from the movie. We had lunch with Bernard Seneca and his wife – what seemed to me to be a classic nice French meal (although who am I to know what classic French is). The first course was a filo sandwich of green and white asparagus with mustard sauce and mushrooms paired with a white wine. Next there was 2nd or main course of chicken stuffed with spinach on rice paired with a red wine. I called this a chocolate tower. Dessert was a three story tower of dark chocolate mousse interleaved with car caramelized sugar topped with a mint leaf. Espresso was served after dessert, of course. 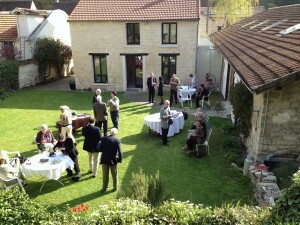 Hope you like the photos Heather, sorry I forgot to get some of the 1st and 2nd courses. This watch is only abut an inch tall. 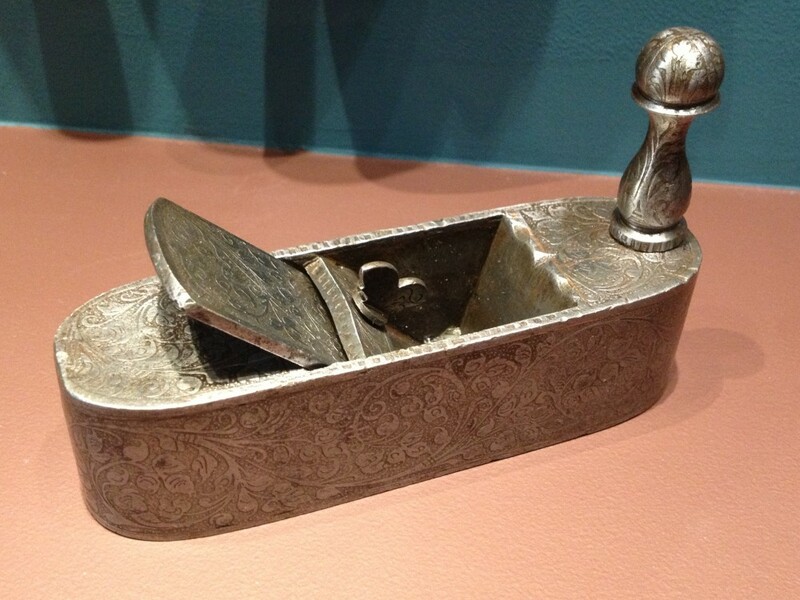 Remember, it was made about 300 years ago with only hand tools. After seeing the coaches we were shown to a collection of coach watches – essentially, time keepers that were carried along with the nobility when they travelled. These ranged from the 1600s to 1800s. The sophistication and artistry of some of these early ones is just mind boggling. These watches were gathered together from several private collectors but most of them were owned by Bertrand Seneca. He is and comes from a family of master watch makers. 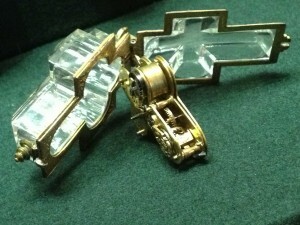 Checkout the detailed engraving. This watch is only about 1.5 inches in diameter. 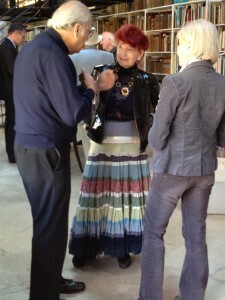 We had lunch with he and his wife -see separate Post for that. and then we were treated to some of Bernard’s private watch collection. We saw at least 20 very old watches that were kind f like pocket watches in that they all had cases so were designed for traveling. 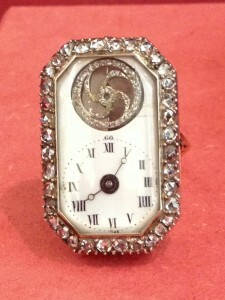 The watches were amazing prices of craftsmanship and the cases themselves were incredible painted porcelain. When I looked at them using my 10x loupe they were incredibly clear and detailed paintings. Sorry no pictures of these because it didn’t seem appropriate. We were all sitting around a table, we were wearing white gloves to handle the watches. Here’s a shot of the full painting – sorry, it is hard to see any detail. 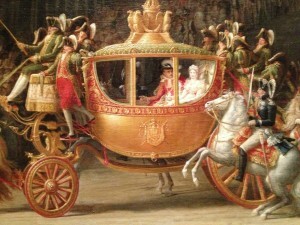 Here’s the carriage in the same painting. designed especially for marriages, coronations, of funerals of the king. 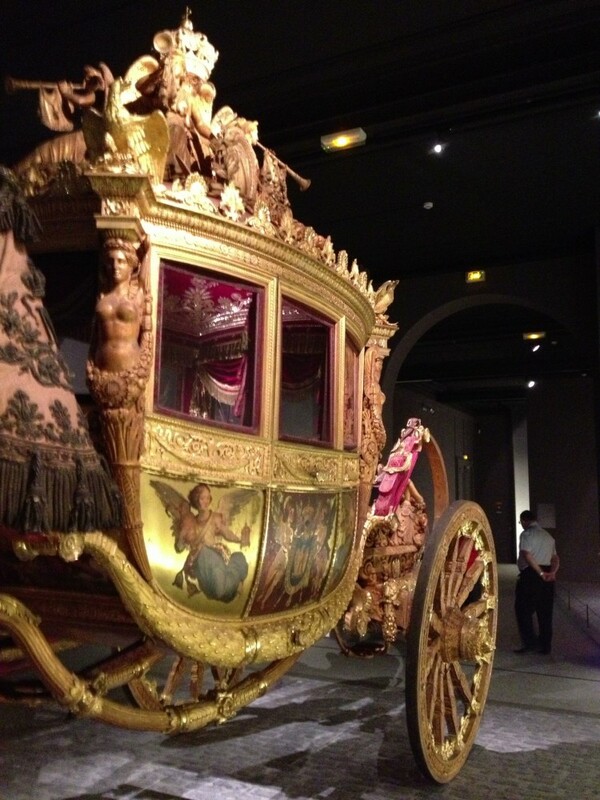 Napoleon had some of the most elaborate ones. It was kind interesting to see the actual coach and then to see that same coach depicted in a painting that was celebrating a marriage or some other event. 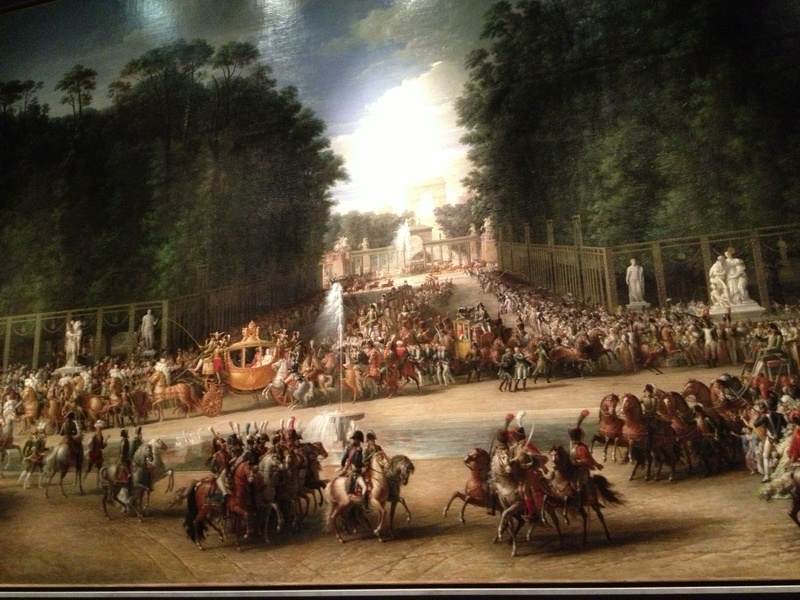 The paintings themselves were amazing and of course, they were very large, like 10′ x 15′.